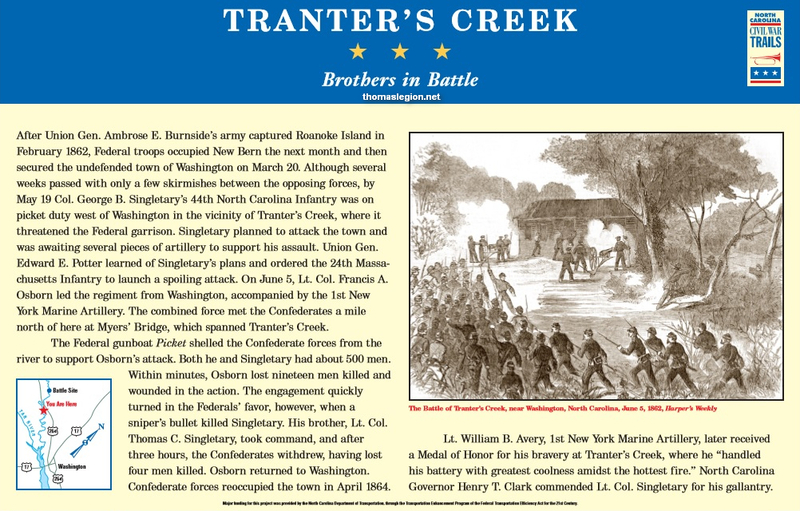 (Right) Beaufort County, Tranter's Creek, N.C. "The Battle of Tranter's Creek, near Washington, North Carolina, on June 5, 1862." Harper's Weekly, June 28, 1862, p. 413. Neg. 83-203. FP1-7-T77c-C582w. On Thursday morning, June 5, a reconnoissance in force started from here (Washington) under command of Lieutenant-Colonel Osborn, commanding the Twenty-fourth Massachusetts regiment, accompanied by Colonel Potter of the First North Carolina Union Volunteers, and Lieutenants Strong and Pendleton, the two latter officers acting as aids. The expedition consisted of the Twenty-fourth Massachusetts regiment, Company I of the Third New York cavalry, under command of Captain Jocknick and Lieutenant Allis, and a detachment from Colonel Howard's Marine Artillery, under command of Lieutenant Avery. 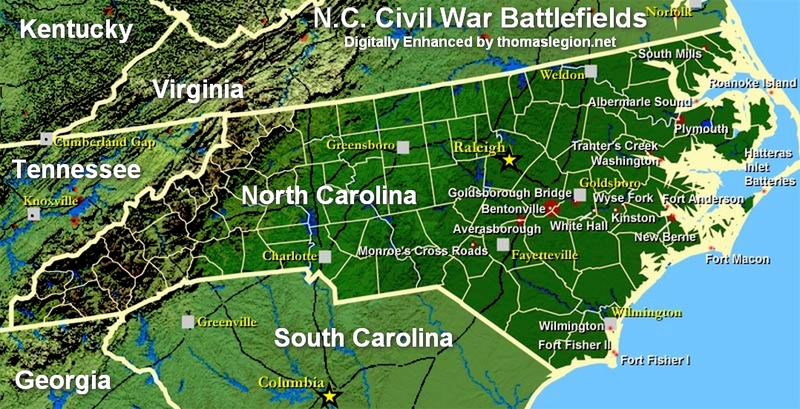 The infantry and artillery, having taken up the line of march, formed a junction with the cavalry on the outskirts of the town, when all advanced along the Greenville road, while the gun-boat Picket, Captain Nichols, proceeded up Tar River and shelled the woods ahead. Its order to understand the progress of the fight, it may be well to here give a brief description of the vicinity. The road, near where it crosses the bridge, descends through a ravine or gorge, and, turning suddenly to the left, skims along by the edge of the creek, which at this point is more properly a wide pond or swamp, filled with stumps of trees. On the bridge are a saw-mill and cotton gin, whose power is derived from the flowing of the water. The rebels had taken up the boards of the bridge between the two buildings, and with them constructed it breast-work, if it might be so called, near the cotton gin. The column at length got in motion again from the widow's house, and the skirmishers, having descended the ravine, cautiously moved toward the bridge. The advance-guard was from Company A, and under command of Lieutenant Jarvis. Coming from under cover of the trees, they moved up the inclined plane at the foot of the bridge, and suddenly discovered a row of heads behind the breast-work of boards, and the guns all leveled toward them. Sergeant Shepard and a companion fired, and a heavy volley came in return. Lieutenant Jarvis fell at the first fire. The rest of the advance returned the volley, and then fell back on the main body. Colonel Osborn immediately ordered forward the artillery, and in less time than it takes to narrate it the gallant marines, under Lieutenant Avery, came dashing down the hill with their guns, which they stationed, one bearing on the enemy's front through the arch of the saw-mill, the other to the left of the bridge, and raking the enemy on their right flank. The main body of the infantry also came forward on the double-quick, while Captain Jocknick formed his cavalry on the brow of the hill, ready to charge the enemy at the decisive moment, though, as it afterward happened, no opportunity was afforded to his men to strike a blow, owing to the nature of the affair. On account of the narrowness of the road, only three companies of the infantry could be brought into action at once, and the rest were disposed of in the rear, where they were ordered to lie down. With one company in the road, and one on either side, the engagement regularly opened on our side. Lieutenant Avery discharged several rounds of shell and canister at the enemy's position; for they were so concealed in the bridge and behind the trees as to be completely out of sight. The infantry poured a terrific fire across and on either side of the bridge, the riddled beams and posts of which soon gave token of the showers of balls which were passing and re-passing. A number of rebels had secreted themselves in the left of the cotton gin, and were firing very briskly when driven out by a shell which Lieutenant Avery lodged in the building. Others again were discovered ensconced in the tree-tops on the opposite side of the creek. 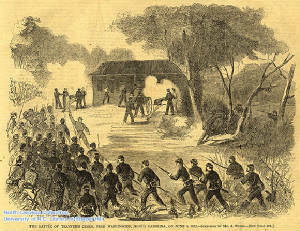 Lieutenant Avery elevated his pieces, and fired a couple of rounds of canister through the branches, whereupon several bodies were seen to fall to the ground, at sight of which our boys burst into a prolonged cheer or yell. The steady firing of the artillery and the volleys from the Twenty-fourth at length drove the rebels from the bridge, and, falling back, they kept up a desultory fire from the trees and the edge of the creek. At length the word was given to charge. The artillery fired a round to clear the way, and, under cover of the smoke and the effects of the canister, our boys with fixed bayonets dashed upon the bridge, and, headed by Colonel Potter, advanced on a run to the point where the boards had been taken up. Replacing them as best they could, they passed over, and found themselves undisputed occupants of the field; for the rebels had fled down the creek and through the woods, leaving behind them three of their dead and a large quantity of muskets, shot-guns, swords, sabres, and other weapons. Their rout was thorough and complete. The ground was covered with pools of blood, showing that their loss was pretty heavy, though it is impossible to ascertain the exact figures, as they carried off all their dead and wounded except the three bodies above referred to, which they could not rescue owing to the heavy fire of our artillery on the spot where they were lying. At the opposite side of the bridge the rebels had thrown up a temporary breast-work of cotton bales in an angular shape, with the corner nearest the approach from the bridge; but it failed to serve them as a means of defense. Our loss on the battle-field was four killed and twelve wounded; but three of the latter died soon after the fight, so that our loss now stands seven killed and nine wounded." Harper's Weekly, June 28, 1862. 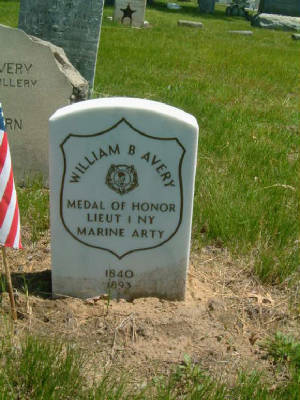 Lt. Avery "Medal of Honor"
Sources: National Park Service; Manuscripts Department, Library of the University of North Carolina at Chapel Hill (SOUTHERN HISTORICAL COLLECTION); United States Department of Defense; Official Records of the Union and Confederate Armies; Harper's Weekly.